unless you are a native american, you are an immigrant. the united states is a nation of immigrants. despite being a nation of immigrants one of most divisive and derisive topics around is immigration and the notion of 'illegal' immigration. last month junk thief posted an episode of the pinky show offering one of the most intelligent analysis of the immigration 'debate' or as wise daisy puts it, the current 'xenophobic rant,' I've run across. I hope all the inquiring minds out in mouseland will check out this episode. but, I warn you it is longer than the average youtube music video, so make yourself comfortable - go pour yourself a cup of tea, a pint or a glass of wine, sit back and watch. I guarantee you will come away with something you haven't thought of before and will probably have a few new 'arguments' in your bag of tricks for the next time you come up against someone railing against immigrants. picture: josef & julia kostelnik and children. josef, julia and the two oldest boys came to america on a boat at the turn of the century (my mother's mother is the second girl to left). circa early 1910s. the family was filled with the hopes that all immigrants have to make a new good life for themselves and for all who follow. The xenophobic ranters would be laughable if they weren't so dangerous. I can't help myself...I don't know if this is legal but I made an award you rock! come by and get it! ekim -all the more reason to be fully prepared to diffuse all those ranters hateful talk. thanks for dropping in! and to think I can thank a couple cats for providing additional info! ca -thank you! I am overwhelmed! you rock. unfortunately I can't seem to view the image of the award - so if you want to email it to me that be great. I would be proud to place it on the mouse! YOU ROCK! Thanks for continuing to promote Pinky! 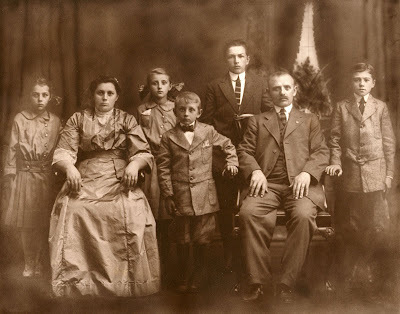 I have similar photos of the Cheuvront family of Montreal on my mother's side of the family tree.